At the heart of the hydraulic press molding processes are TMP’s state-of-the-art Control Systems. The TMP-designed and supported controls are microprocessor-based systems designed to improve product quality through better pressing accuracy, repeatability, versatile process control programming and monitoring of data for analysis. The operator-friendly systems are composed of industrial-hardened hardware, standard software and software languages. TMP offers two standard control systems, proven for their ability to precision-mold or laminate a wide range of materials and products. Customers are more commonly integrating the CPS and Edge Control Systems with new equipment. However, French and TMP can also perform an advanced control retrofit on an older hydraulic press system to improve your production process. We want to learn more about your manufacturing requirements and needs, so we can work together on improving your process with our advanced control systems and CPS integrations. Contact us to learn more about our capabilities. The CPS system is designed for molding of thermoset (rubber) material and is applicable to straight compression molding, hot or cold pot transfer molding, and transfer molding press. The system offers multiple segments of pressure control with the ability to accurately control the rate of pressure application to the molding process and includes degassing if desired. The Edge system is designed for laminating of thermoset laminates and thermoplastic laminates. It offers multiple segments of pressure and temperature ramping control and is designed for heated and cooled hydraulic presses or hot and cold press systems. Industrial hardened color touch-screen operator interface with user-friendly displays showing all machine set-points and actual data in real time, recipe control and diagnostics. Unlimited storage of recipes and historical process data. All data may be displayed as time based trend graphics. Hydraulic system allows simultaneous press functions by using proportional valves, linear displacement transducers and pre-fill techniques. TMP’s hydraulic systems are accurate, reliable, efficient and highly responsive. 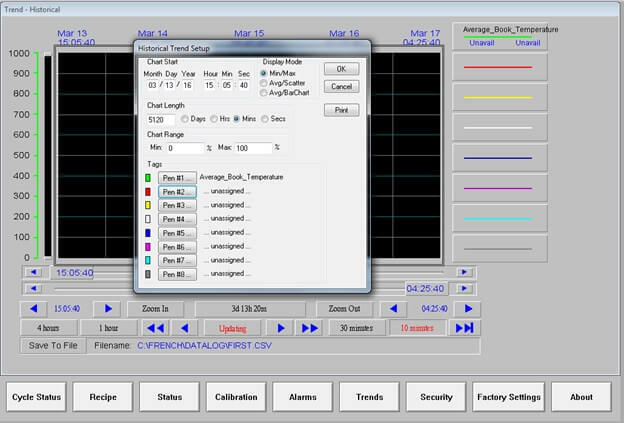 Whatever the molding or laminating task, TMP can provide in-house control design at the most efficient level. Additional controls or custom features are available as your molding process dictates. Read how upgrading your hydraulic press control system to our specialized recipe and data collection, the Edge II Control System, increases your ability to maintain consistent production quality. In addition to recipe creation and storage, the PC based system allows several customizable security levels and critical data collection. TMP, A Division of French was awarded a contact with the Defense Department for six self-containing C-Frame style heavy duty transfer molding presses to mold rubber components. Read how the hydraulic presses were built with 18” x 18” electrically heated platens, with an adjustable heating rate and other custom capabilities.